SSG Mcelhaney, SGT White and SGT Lamere extending their service to this nation prior to the Seahawks kicking off against the Raiders. 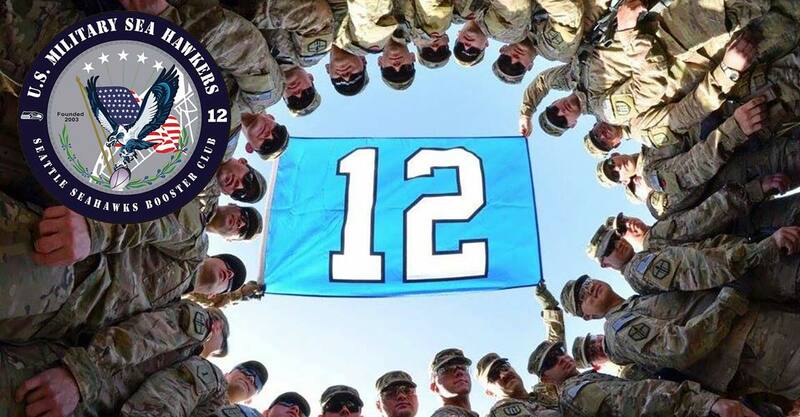 Military Appreciation Day is this Sunday at CenturyLink Field, so if you’re going to be at the game be sure and check out the activities listed in the link on the right side of the newsletter. For those who aren’t able to make it to the game or are outside the area, we’ll be posting photos of the festivities and posting on our Military Sea Hawkers Facebook page. Prior to the game, we’re looking for Cell Phones for Soldiers volunteers to collect phones or funds for the cause. If you would like to help, please email military.seahawkers@gmail.com. With Veteran’s Day next week, I included a link to this year’s free meals and discounts for service members and veterans. Some offers begin as soon as the 10th and some end on the 12th, so you can visit different locations over three days if you plan things right. Last Sunday, Marshawn Lynch had a big game against his hometown team, leading the Seahawks to a 30-24 win over the Raiders. The game wasn’t quite as close as the score would indicate. Seattle was up 30-17 with two minutes left to play and recovered an onside kick to seal the win. Russell Wilson had a rough outing behind an offensive line that was missing three starters and in the pouring rain. Special teams also struggled a bit, allowing a blocked punt for a touchdown and Jon Ryan had a short punt the Raiders returned to the Seatlte 30-yard line. Oakland scored on the short field. Positives out of the game were seeing Bruce Irvin tip a pass to himself and return it for a touchdown and Richard Sherman pulled down his first interception of th year. The Raiders turned the ball over on three straight posessions, but struggles on the offense and a missed field goal limited the team to only 10 points off three takeaways. Seattle’s defensive line faces a tough challenge this week against one of the most efficient pass blocking offensive lines in the NFL and a quarterback in Eli Manning who gets rid of the ball quickly and rarely takes a sack. Since Wilson took over behind center, the Seahawks will look to improve their undefeated record against quarterbacks with Super Bowl rings. With New York suffering from a depleted secondary (even worse than it has been in Seattle) look for Russell to have a good day throwing the ball after only connecting on two passes of more than 10 yards last week. I’m a bit bummed, because this will be the first Military Appreciation Day game in several years I won’t make it out for. Fortunately that means I have an extra ticket if anyone is looking. This week the AFN Fan’s Choice Game of the Week is the Miami Dolphins at the Detroit Lions. Immediately following that game the Seahawks take on the Giants for Seattle’s Military Appreciation Day game. The game is scheduled to air on both AFN Sports and DTS Sports at 1300 PT, 2100 GMT and 0130 in Afghanistan. Another week and another victory that is a bit too close for comfort. Adam and Brandan take a look at some of the best and worst performances of the week among Seahawks players. After getting out to a first-half lead of 24-3, they talk about some of the events that led to the Raiders getting back in the game. With the Giants next up on the schedule, there’s a lot of reasons to be optimistic with several players set to return. Brandan talks about Eli Manning and the matchup issues he and the New York offensive line present to the Seahawks defense. Johnnie Ramona Peel, Dave Kreig’s Strike Beard blogger, returns to the show for the first time since October 2013. Johnnie compares the win over the Raiders to a meal at Taco Bell and the start of the season to the 2004 Seahawks team. She also revisits the story of how her blog came to be named after a majestic beard of the 80s-era Seahawks quarterback. The guys read some of the latest emails to the show and “Do Better” nominees include Dan Snyder and Bill Simmons. A World Series pitcher with a historic performance and Tom Brady share “Better at Life” honors for the week.